As the name implies, this company is named after its founder, Mr. H.C Waltersons. Mr. H.C Waltersons is a mechanical engineer who developed a great passion and enthusiasm towards machine science over the course of his career. Born in the late forties, his career began as an apprentice in a shipyard, after which he became involved in various industries, including constructing turbine generators for power stations, and consulting on oil drilling platforms, before finally settling down, manufacturing consumer goods for the mass market. Their company slogan, "made for enthusiasts", means they are driven to create products to cater to the needs of hobby enthusiasts. Mr. Waltersons is determined to develop products that cater to what hobby enthusiasts are really looking for. He is a man who shares similar dreams with many like-minded fellow modellers. As a result, they are committed to create products that will inspire your appreciation and interest in the area of radio control model tanks, and beyond. 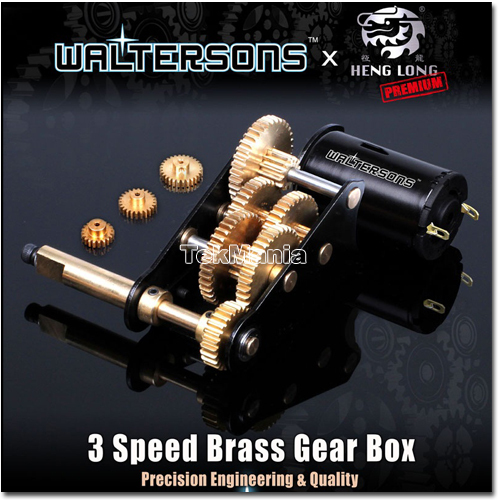 We are proud to present the first, unique, range of solid brass 3 speed gearboxes. There are 4 models in the range, covering the most popular models from the 1:16 scale model tank range. This 3 speed gearbox upgrade is designed to handle additional weight on the tank after other metal upgrade parts have been installed. The drive motors are specifically designed with additional magnetic poles to generate extra torque at low rpm speed. The highlight of this upgrade is the option available for users to change the drivetrain profile by inserting one of three different sizes of gear pinions. Available in four different shaft length configurations.